Clear up your skin and prevent the recurrence of acne with AcnEase Acne Maintenance Treatment, designed as an additional supplement for use after the initial treatment for continued results. This natural treatment is the perfect remedy for those who suffer with chronic or severe skin problems or body acne. Safe and free from side effects, the capsules are specially formulated with all-botanical ingredients to help both male and female adults and teens. The treatment restores the internal balance that can be disrupted by endocrine changes, the environment, stress, medication and diet, addressing the underlying causes of skin conditions. 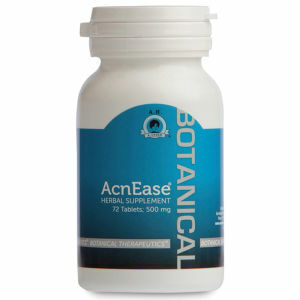 Been using Acnease for about 3 months and I'm getting less spots. I'm 44 and have always had hormonal outbreaks and this product has helped. Its a product worth trying . I am a female in my 30s with mild/moderate acne for over 10 years now. With the appropriate diet this product works a treat. If you keep eating junk and expect this pills to make miracles don't bother. Every time my acne gets worse a do a month or 2 treatment and my skin clears up visible after a couple of weeks. Too bad they run out of stock so frequently. These Acne Maintenance Treatment tablets truly work!! Buy with confidence!! I have spent 20 years on different anti biotics from my GP and none of them work after a little while. These tablets are truly amazing. Admittedly they are not cheap, but for confidence and a happy you, they are worth it to me.